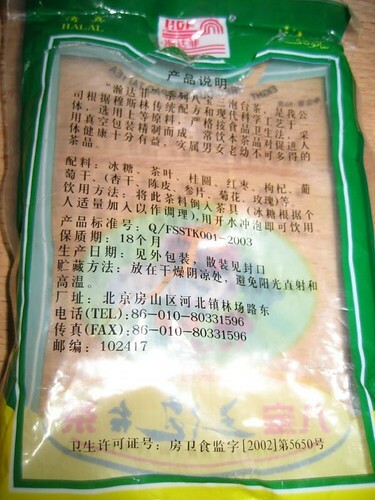 Yes, the package says “Eight Precious San Pao Tai Tea.” This is some of the precious little writing in a Western script. The rest: “Halal“–good to know that this fits into religious dietary restrictions. And “Tel” and “Fax,” so when the time comes for me to call and complain, I know how to get in touch with the manufacturer (not that we share a common language). Oh, and also “Don’t litter” next to the “Don’t litter” logo. I’m genuinely curious as to what the rest of the package says–it had quite a bit of writing–so if anyone reading this knows Chinese, please enlighten me. Even though I couldn’t read the package, tea is a universal language. 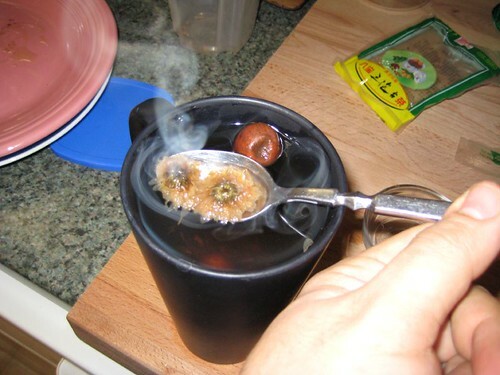 I put some water on to boil. 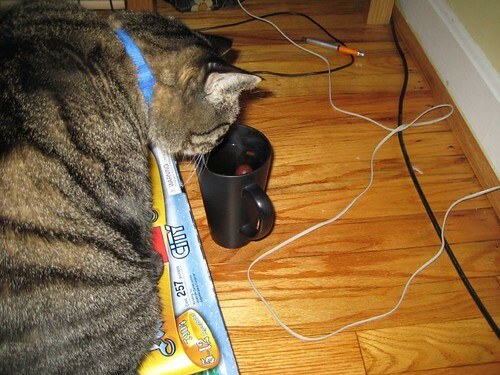 Meanwhile, a closer inspection of the package contents, which were a bit out of the ordinary for a typical tea. On the left, we see what seems to be some nice, high quality green tea in a vacu-sealed package. 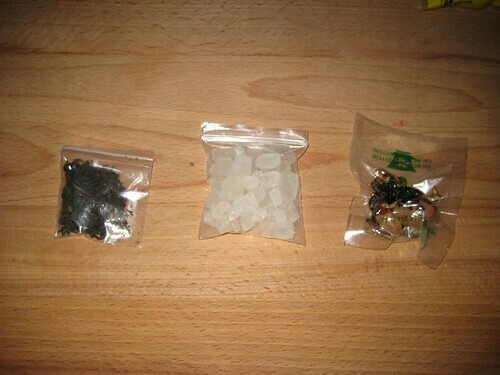 To the right is what at first I thought was pearl tapioca, but which proved to be rock sugar. And quite a bit of it. 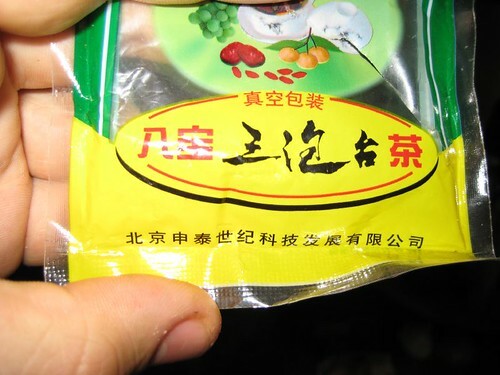 Finally, at the far right we see the most mysterious component of Eight Precious San Pao Tai Tea: a vacuum sealed package of strange vegetable matter, presumably the titular eight preciouses. The exact composition was, at this time, unknown to me. 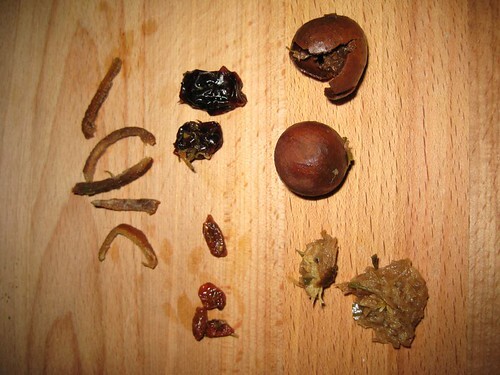 The contents had a slightly flowery, plummy, tamarind-ish aroma to it, but I couldn’t actually identify anything beyond “some brown bits and a couple of round seed-poddy things.” Judging from the package, these items might include grapes, goji berries, and… round seed-poddy things. Anyway, into the hatch everything went, and on with the boiling water. Based on the picture on the package, it looked like it would make more than a typical teacup’s worth, so I used the largest mug we had, weighing in at about 16 ounces. I let it steep until the sugar had mostly dissolved. By this time, the dehydrated veggie bits had softened up enough that they could be identified. There was quite an interesting variety. First, there were the flowery bits. I’m not sure what these were. Some kind of chrysanthemum, maybe? In this picture you can also see the mystery seed pod thingies. More on those later. Next: miscellaneous brown bits. And that was about all I could determine from a visual inspection. Beyond “flowers and brown stuff” there wasn’t much that was clear, though some of the brown bits had a definite rind-ish quality to them. On to odor and flavor. Once I got over the thought of having to drink around all the floaties, I gave the tea a good whiff, and found that it was… surprisingly pleasant. It was sweet and floral, and most certainly tea. And it was extremely refreshing to drink, with the same floral notes coming through. 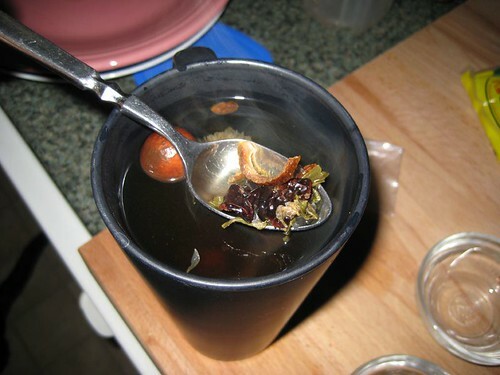 The tea was almost too sweet, however–I’m glad I used double the typical amount of water, because otherwise the amount of sugar in the tea would have been off-puttingly cloying. After finishing it, I needed to investigate the solid remains in order to better understand them. In addition to the tea leaves, there was an interesting array of objects. The seed pod seemed to be some kind of drupe–there was a hard outer shell, with a nut-like interior covered by a thin layer of flesh. 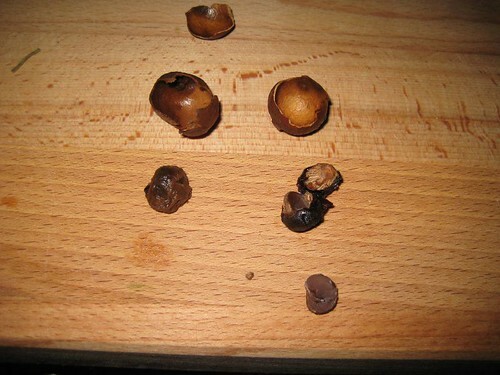 Inside the inner nut was something that looked like a hazelnut. However, this inner nut object did not yield to my attempts to ingest it, so investigations effectively came to a halt. The mystery remains. As far as strange hot-brewed beverages go, this was surprisingly not bad, except for the bits of flower petals that got stuck on my tongue every time I took a sip. I dare say I’d even drink it again. So, the final judgment: is it food? Yes. Or, at least, drink. One thing that confused me was that I only counted five preciouses when I was investigating the mystery items. 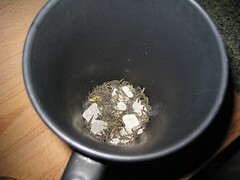 Even counting the sugar crystals and the tea, we have seven precious tea. Is hot water the eighth? So yes. It is food. At least as far as I’m concerned. Zeke, however, seemed to disagree. < Previous NC State Fair: Do you dare? Also, you were probably meant to brew the tea and then add the sugar to taste… but if it wasn’t too sweet then I guess it doesn’t matter too much. Well, that explains a lot. I guess I was right about a few things, though I swear there are goji berries in there (and not just goji berry leaves)–but maybe those are the dried grapes. I’m still not sure which of those items is the creepy seed pod thing. 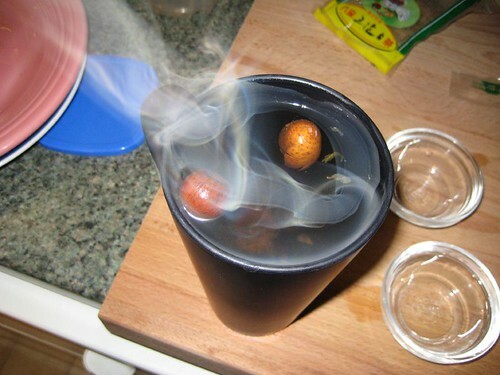 The longan, maybe? Eighteen months, huh. At least I’m still alive! Also, thanks for translating! Anything else interesting on the package? Obrigada! Ganhei um estava tentando saber como preparar. I was in China in 2016. I love this tea. Is natural from Gansú, central north of China. I’m panameniam but i to learn 8 treasure.